Moral ambiguity ties into a world seemingly devoid of innocence in Ron Morales' Graceland, the latest film acquired and distributed by Drafthouse Films. A tightly-wound kidnapping thriller set in the overly corrupt Philippines, Graceland strikes a spark early on and never seems interested in dousing the flames until all of Morales' characters are burned, even if just a little. The screenplay adds new elements and interesting facets to the familiar sub-genre, and Morales' direction drives the point home even harder. For all that it has to say, Graceland is a bit hard to watch, but its message deserves to be a bitter pill to swallow. That bitter pill is noticed early, when Marlon (Arnold Reyes), a chauffeur to a corrupt politician, has to drive his boss' latest conquest home from a night of debauchery. The "conquest" is a 14-year-old girl, and instantly, the whole world within which Morales' story unfolds becomes a giant, gray area. It's this sick boss' 12-year-old daughter who, along with his own daughter, Marlon drives home from school. But one day, a man posing as a police officer gets into Marlon's car with the intent of kidnapping the politician's daughter. Things go wrong, the politician's daughter ends up dead, and Marlon's daughter is the one taken. The driver's world, already bleak, quickly spins out of control, and he must find a way of getting his daughter back without letting his boss know the truth of the botched kidnapping. The film rings vaguely familiar of Akira Kurosawa’s classic High and Low, but where that film’s kidnapping mistake lead a wealthy businessman to choose between his own financial legacy and the life of an employee’s child, Graceland focuses on the poor father, the driver who must jump hurdles and dodge exposure to keep his own daughter alive. Morales handles both screenplay and direction with an unflinching eye, revealing the dark secrets most of his characters keep locked away while also revealing the very real darkness and distress seen day-in and day-out in the poor parts of this corrupt world. 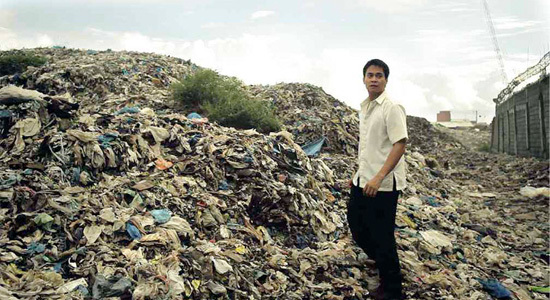 There is no respite for the characters in Morales' world, what can only be the film maker's genuine view of The Philippines. There seems to be no break in the dismal conditions in which the have-nots live, no cease in the pain they endure. We see Marlon visiting his wife in the hospital, likely dying from some unnamed disease. Even if the kidnapping situation resolves as well as it can, there is still no guarantee of "Happily ever after…" in this world. Quite the contrary, in fact. However, Marlon remains a beacon for hope in Graceland, a father who wants the best for his daughter, even if that best isn't all that good. Morales utilizes the passion that would naturally come from such a character to the very best of its ability. The drama and intensity scattered throughout Graceland is never edge-of-your-seat material, but it holds your attention firmly. When it twists, you twist with it. Morales' film shows very harsh truths about its characters, none of which the film maker shies away from showing. Such an audacity in storytelling divides audiences, keeping the more casual moviegoer to walk across the hallway to the latest Blockbuster. When this level of grit and realism is found in a film, audiences can't be faulted for not wanting to endure it. For those who can, though, the impact and, oddly enough, beauty in Morales' storytelling becomes clearer and clearer with each, ensuing scenario Marlon finds himself faced with, from the kidnappers who may have deeper motives than money to the politician whose dark past might be finally coming to light to the corrupt (there's that word again) policemen who believe Marlon may have had something to do with it. The impact wouldn't be nearly as evident were Reyes not such an engaging actor. Eyes bugged and seemingly bulging with tears that could spew out at any moment, Reyes turns in an overly convincing portrayal of a man challenged: physically, mentally, and emotionally. Each of these weigh on the character progressively harder as the story unfolds, and Reyes' every look, movement, and delivery draws the result of that weight out to the audience. It isn't long into Graceland before you realize you do not, cannot, want to see this man's eventual breaking point. Morales' depressing world doesn't make itself fully known until the final scene, and though vagueness about anything that happens in Graceland's third act may still reveal too much, it's this scene that resonates the deepest and loudest of any others. It's that moment when you realize it's not just a twisted story these characters are trying to get through. It's their lives, their world and every day they live in it, that's twisted. There is no escaping from it, and ultimately, the pessimistic world Graceland unfolds gives us something more dangerous than gritty kidnapping plots and nefarious politicians. The whole world here is culpable, and in such a world, there are two kinds of people: those who are corrupt and those just haven't been corrupted yet. For better or for worse, Morales' tale scathes and his message reverberates long after it ends. Graceland opened theatrically on April 26th. You can also view it through VOD/iTunes. To find theaters and purchase tickets, follow this link to the film's official site. This is just one of those movies where every film-aficionado needs to see before he or she dies.